Contains 8 oz of anti-fog, anti-static cleaner and 600 tissues. 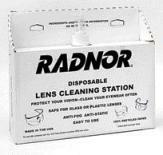 Radnor Disposable Lens Cleaning Stations are available in sizes large or small. The large station includes 1,200 tissues which measure 6" by 5" and 16 oz anti-fog, anti-static liquid cleaner. The small station includes 600 tissues and 8 oz of anti-fog, anti-static cleaner. This cleaning station which is designed to eliminate refilling and maintenance can either be mounted to the wall or set on the counter.